An estimated 40% of landfill waste comes from construction sites. However, that statistic can be reduced, at least in part, by some fairly simple practices. When Boone County Government decided to renovate their main building and create an Annex from an existing nearby structure, they set a goal to recycle 50% of the project’s construction waste. By writing into the specifications a requirement for the contractor to create a waste management plan, and a cooperative general contractor, the project was able to achieve their goal. The plan basically involved identifying materials that could be diverted from the landfill and matching them with agencies that could recycle or reuse the materials. Then, the contractor submitted a plan showing where on site these materials would be collected and stored, along with regularly reporting the percentage of waste, by weight, being diverted. Instead of being charged landfill tipping fees for every ton of waste, some of those materials, like clean gypsum board scraps, went to the City’s compost at a reduced fee. Armstrong brand ceiling tiles were sent back to the manufacturer to be recycled at their facility, at no cost to the contractor. 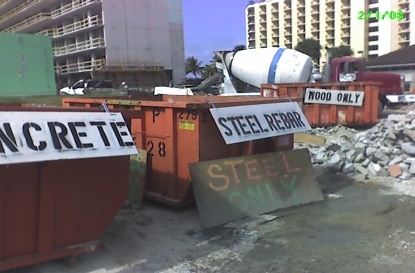 Scrap metal was purchased from the contractor by the local recycler. Local non-profits picked up materials, saving landfill fees – Habitat for Humanity ReStore took carpet tile and bathroom fixtures, and the Columbia Center for Urban Agriculture turned three tons of wood studs and siding into garden sheds!